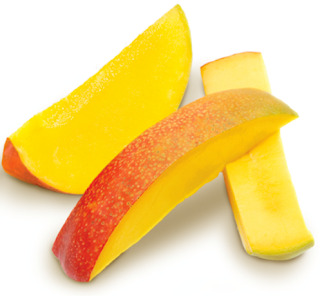 Chlorophyll, carotenes, anthocyanins and xanthophylls are principal pigments present in the mango. High content of anthocyanins is present in the ripened mango peel, whereas unripened mango peels contain more polyphenol constituents. It was reported the presence of anthocyanins in the mango peel in the range from 203 to 565 mg/100 g (dry matter), depending on variety and stage of maturity. Loss of green skin color is one of the common characteristics of ripening in many mango cultivars. Some cultivars show reddish blue skin color due to presence of anthocyanins. These skin color changes are due to the disappearance of chlorophyll and the appearance of other pigments (carotenoids and/or anthocyanins).